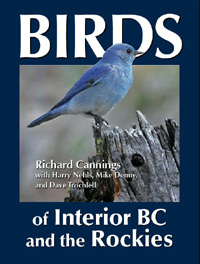 Discover over 250 birds species–all the ones commonly encountered–from the east slopes of the Coast Mountains to the Rockies, including the Okanagan, Thompson, Kootenays, Cariboo-Chilcotin; Jasper, Banff and Waterton national parks; and Highway 16 west from Jasper to Smithers. This guide includes 400 sharp, full-colour photos and space for keeping track of sightings. Learn how to identify local birds, where they live and what they eat, and how to attract birds to your yard.